The Skageflå hike offers stunning views, as it skirts the edge of Geirangerfjord, one of the most magnificent fjords in Norway. Here is all you need to know for this excellent hike. Geirangerfjord is one of the most imposing fjords in Norway. A steep narrow inlet of water gives way to towering cliffs of rock, peppered with long slender waterfalls. With no habitable shoreline to speak of along the 15 km length of Geirangerfjord, farms were forced to reach for the skies to make a living. So, these near vertical cliffs are home to farms with such hazardous access that it’s almost inconceivable they were ever built. But, in spite of the tricky location, there’s one farm on Geirangerfjord that achieved a level of fame. Around halfway up the steep slope of the fjord sits Skageflå farm. Perched on a tiny precipice; this stunning yet remote location offers a fantastic hiking opportunity. The Skageflå hike winds its way around near-vertical cliffs, has stunning views over Geirangerfjord and allows you to explore farming life from the centuries gone by. Furthermore, thanks to a bit of Norwegian know-how, it is not too difficult to take a ferry to the perfect location to start this spectacular walk. Here is all you need to know to do the Skageflå hike. Our 10 days in Norway offered us many amazing sights. UNESCO listed natural beauties appear at almost every turn. Jaw-dropping views of jagged mountains, iconic fjords and quaint villages are stacked one after the other. But Geirangerfjord was one destination we were particularly excited about. It’s renowned as being Norway’s single most dramatic stretch of water, and a popular choice for many holidays in Norway. The morning before we intended to do the Skageflå hike, we had taken a series of nail-biting hairpin turns up the Nibbevegen road to Dalsnibba Viewpoint to get our first glimpse of Geirangerfjord. The viewpoint ends at the Geiranger Skywalk, an ambitious feat of engineering perched above the fjord. Picture yourself floating on a glass platform, high above the clouds with a 1500m drop to the fjord below. The views are simply spectacular as sheer mountain peaks rise dramatically on either side, and the fjord curves off into the distance. Incredible views, no doubt. But, we weren’t here to do it the easy way, we were here for the Skageflå hike. So, after a few quick selfies at the Dalsnibba viewpoint, we were back in the car to make our way to Geiranger to start the hike. Skageflå farm sits halfway up the cliffs of Geirangerfjord about 9km west of Geiranger town. It’s possible to walk to the farm from the town, which takes over 3 hours. However, there’s a slightly more novel way to make it to the farm: the Geirangerfjord Ferry Service. The Geirangerfjord ferry is a great way to see one of Norway’s most spectacular natural wonders in its own right. The tour is undertaken by knowledgeable guides who sprinkle the trip with information about the fjord. The ferry gets close to admire the Seven Sisters Falls, the longest of the 7 streams boasting a free fall of 250 metres, and Bridal Veil, named because of the affect created when backlit by the sun. But after about 30 minutes, the ferry gives walkers the opportunity to hop off half way down the fjord at Skagehola, positioned 250m below Skageflå farm. You can then climb up the cliffs to the farm meaning you don’t have to do the long walk from Geiranger. Hopping off, however, was one of the trickiest parts of the hike. The boat stops in front of a very slippery patch of wet bank; polished by the footsteps of many walkers who had gone before us. Dismounting from the boat and remaining upright takes some precision footwork. A clearly marked path rising steeply to our left ascended to a ledge before disappearing from view. So, taking a deep breath we put one foot in front of the other and slowly made our way onwards and upwards as the slippery path clung to the edge of a precipitous slope. It’s a steep climb and a bit slippery in places. Our hands grabbed at the ropes and handrails that offered help as our breathing got heavier and hamstrings tighter. But there is nothing here that a bit of concentration and stamina can’t overcome. On the way up there are various opportunities to get off the trail, let quicker walkers pass and pretend you’ve stopped to take some photos of the view while allowing your heart rate to return to normal levels. But while catching your breath, there is not much pretending that needs to be done, because these are spectacular views as towering slopes rise all around you and the fjord gets progressively further away. Fortunately, it’s not very far at all, and no sooner had we begun to tire than we had arrived. After 45 minutes of climbing and 250m of ascent, we rounded a corner to find the Skageflå farm standing in front of us, and the views of Geirangerfjord lay in majesty behind it. Skageflå is one of a number of mountains farms with a long history in this steep terrain. It was once one of the richest goat farms in Geiranger and was inhabited from the middle ages until 1916 when it was finally abandoned. Located 250 metres above the fjord, and with very limited access, you’ll wonder how they ever built the farm here in the first place. The steep drop from the farm to the fjord below is so precarious that the farmers chained their children up when they were outside playing to stop them falling off the edge. Looking around the long-abandoned farmhouses is fascinating; the years of moss growing over the old wooden buildings create fantastically atmospheric photo opportunities. The doghouse, with sunlight pouring through the trees above it, is a recognisable Instagram hit. Most importantly it’s a fantastic spot for a beer. You’ll need to bring your supplies up with you, but the additional weight in your rucksack is well worth it for the ability to enjoy a much-deserved beverage at this picturesque altitude. There’s a table towards the edge, but if that’s taken, there’s plenty of well-positioned rocks to sit an enjoy one of most spectacular, and well earned, views in Norway. After looking around the farm we had two choices: head back down to Skagehola and wait for the next ferry back to Geiranger, or continue onwards and upwards, over the cliff tops and back to the town on foot. Being such a gorgeous location, it seemed a waste to not enjoy as much time in it as possible. So, we took off on the path that continued to rise higher up the cliff face. We spent the next hour rising 300m up the steep and tricky cliff face to reach the highest part of the Skageflå hike at 550m. From here, the hard work is all done and the next 5 km is spent enjoying the gradual descent down to Homlongsvika. The trail is mostly set back from the precipitous drop, yet still offers excellent views over Geirangerfjord. The final 3km from Homlongsvika to Geiranger is not as spectacular, but very straightforward, as it follows the road along the waterfront. It’s fair to say we were suitably impressed with Skageflå and Geirangerfjord. Is it the most dramatic stretch of water in Norway? Quite possibly. Although, with so many amazing sights in this one country, I wouldn’t want to be the judge of that. And there’s no need. Sitting across from this dramatic fjord, taking in the sublime scenery, you realise you don’t need to worry about ranking any of Norway’s sights. They’re all stunning. The Geirangerfjord ferry service from Geiranger to Skagehola (250m below Skageflå farm) leaves from the harbour in Geiranger every couple of hours during the day and takes 30 minutes. Only the traditional boat, and not the new catamaran service, stops at Skagehola. Prices and timetable for the boat can be found here. The steep hike from Skagehola up to Skageflå farm takes 45minutes. The path is well worn, clear and steep but not particularly tricky. If you intend to return to Skagehola and take the boat back to Geiranger, make sure you know the ferry timetable. The boat only goes every couple of hours and you do not want to miss the last boat of the day. The hike from the Skageflå farm back to Geiranger steeply ascends 300m before descending 500 meters more gradually. It is 9km and takes about 3 hours and 30 minutes. The hiking route is well marked. A hiking map is available here. No special equipment is needed for Skageflå hike, but we recommend good sturdy walking shoes, a raincoat, a head for heights and a bit of stamina. There are no facilities to get food and drink on the way, so bring what you need with you. In particular, take beer! If you have more time in Geirangerfjord then further paths can be found here. To put the Skageflå hike an incredible Norway itinerary, see our post here, or read about our misadventures in Turtagrø. You might also be interested in other hiking options. Wow, absolutely gorgeous, your pictures are amazing. I would love to visit Norway and do this hike. Glad to hear the trails are well-marked and you don’t need special equipment. Thanks for sharing on #TheWeeklyPostcard. Thank you so much. It’s a very beautiful country, this is really just the tip of the iceberg. Hope you make it there someday soon. It was a really beautiful hike, a bit of hard work but all worth it for those spectacular views. Shame you missed it but there’s always next time! Good excuse to book another trip to Norway. Thanks for stopping by Liana. Wow your photos and descriptions are so vivid, I almost feel like I was there too!! Would love to experience Norway one day! 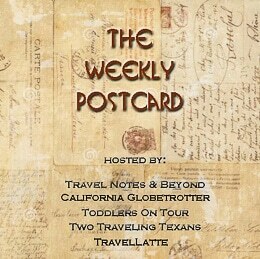 Thanks so much for sharing on #TheWeeklyPostcard! Thank you very much. It’s easy to describe such a beautiful place so vividly. Hope you find to time to make it to Norway someday because it’s a stunner! Thanks Jill. Yes it was an incredible hike. Little bit of effort but it was well worth it. Thanks for your comments! Incredible hike – would definitely be very high up on my list of hikes to do in Norway and I really do need to make some time to visit it (I was there as a child for a few days before chicken pox cut my trip short!). Thanks for the detailed post! It’s a fantastic spot for a hike and a beautiful country in general. Assuming you’re over the Chicken Pox by now I’d definitely give it another go! Thanks for your comments, nice to have you stop by. Thank you very much. Yes, it’s a beautiful place, it was such a great hike, one of our highlights in Norway. The scenery and the farm are spectacular. Yes yes yes!! I would loove to go hiking there! Absolutely magical. One step after the other is my mantra too when it comes to climbing steep trails! I can’t believe they managed to perch a farm there. Truly an amazing place and on top of my Norway list! It sure is a magical place and the effort to get up there makes you appreciate it even more. I can’t believe that got a farm up there either! There must be easier places, but it’s good travel fodder.